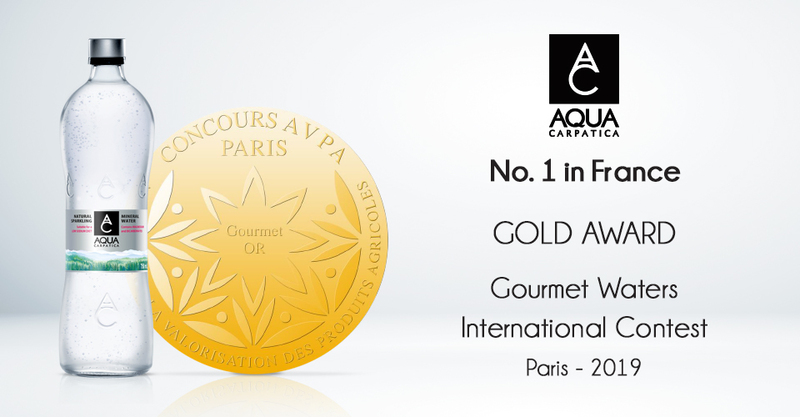 AQUA Carpatica Naturally Sparkling Mineral water obtains the GOLD medal in the ”Balanced waters of character” category at the 3rd edition of Gourmet Waters International Contest organized by AVPA (Agency for the Valorization of Agricultural Products) in Paris. Juries made up by experts, foodies, specialists of taste and chefs, including those of the Culinary Academy of France recognized AQUA Carpatica as a leader in a very challenged category. The award is a resounding success for AQUA Carpatica and we are deeply honored to receive this sign of recognition at a prestigious contest who brought together more than 70 waters from 5 continents, all competing for the Gold Medal in their category. The bottled water brands were divided into 6 different waters categories (3 categories for still waters- light still waters, balanced still waters, still waters of character and 3 sparkling waters categories: light sparkling waters, balanced sparkling waters and sparkling waters of character) and had to demonstrate their qualities to the juries. The 3rd edition of” Gourmet Waters” International Contest organized by AVPA drew a conclusion on Monday, April 1st during an official ceremony held in the presence of the diplomatic corps and the Jury members. Mineral waters producers from 20 countries have met for the award ceremony in the salons of the great cookery school FERRANDI-Paris, one of the temples of European gastronomy. This event, very expected by bottlers, by professionals from the catering and distribution sector has reserved, as every year, surprises and confirmations. In front of an audience of diplomats, great chefs, taste professionals and distributors, the lucky winners, succeeded on stage. “A strong time in the lives of these entrepreneurs who would not miss for anything in the world, this event which became in a 3 years’ time, one of the flagship events of the waters planet and a sign of encouragement and recognition for the medalists.” has declared Michel Bontemps, the competition’s Contest Director. “Beyond its formidable success, this 3rd Edition of the “Gourmet Waters” International Contest AVPA-Paris 2019 demonstrated the gastronomic potential of water when it becomes Gourmet and thus it is the whole chain of bottled waters which is honored” declared in conclusion of the ceremony Philippe Juglar, President of AVPA. In the balanced sparkling waters, AQUA Carpatica Naturally Sparkling Mineral water has obtained the acclaimed GOLD prize. The taste of water comes from its mineral content, the underground path it takes and the geological structure of the spring area. AQUA Carpatica Sparkling Mineral Water deposit is the outcome of a complex hydro-geological process. This process requires a long-time natural filtration of over 40 years, which takes place in the depth of the Oriental Carpathians (the Eastern part of the Călimani Mountains). The blending of the meteoric water and the CO2 takes place at a great depth in the volcanic andesite rocks of over 10 million years. AQUA Carpatica is drawn from a pristine and pure aquifer, nestled deep in the heart of the untouched Carpathian Mountains and has conquered taste specialists and consumers around the world with its unmatched pure taste. The Carpathian Mountains is a unique hydro-geological phenomenon for mineral waters. The metamorphic rocks represent a geological structure wherein, after a long underground path, the meteoric water is naturally purified. Deep within the volcanic structures of Călimani Mountains, the carbon dioxide takes an upward journey, impregnating the deep areas of the naturally filtered water. The heavy fissured areas allow the ease of the sparkling mineral water deposits. Thus, by the means of drilling the heart of the hydro-mineral deposit can be infiltrated and a pure, nitrate-free water is obtained. Through a natural 40 year filtration in a location with no agriculture or industrial activity in the surrounding areas, AQUA Carpatica’s source is protected from chemicals and other contaminants, meaning it is simply as mineral water should be: pure, virtually nitrate free, extremely low in sodium, with low mineral content and containing natural electrolytes, it makes for the ultimate way to keep to keep hydrated, especially whilst exercising. The title received at Gourmet Waters is accompanied by several other international recognitions and awards for AQUA Carpatica Sparkling Mineral Water taste such as the Superior Taste Award by ITQi- The International and Quality Institute and Fine Waters International Competition in Guangzhou, China.